Meet the new baby MG! The MG3 has just gone on display at the Guangzhou Motor Show in China ahead of its arrival in Chinese showrooms in March next year. 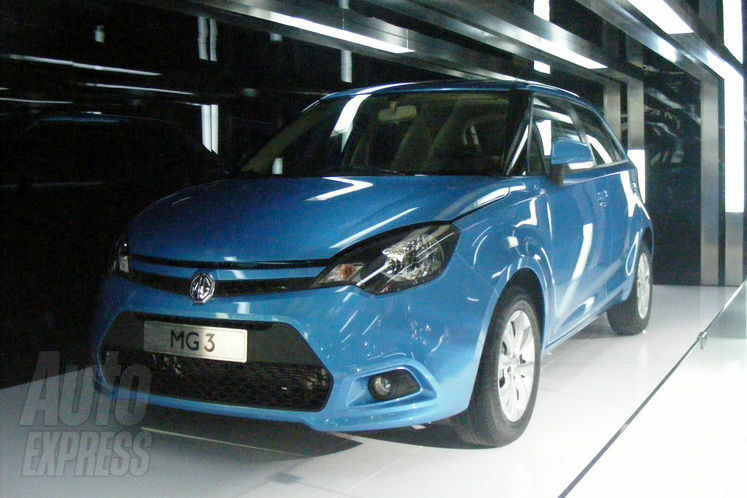 Designed in the UK, the production MG3 draws heavily on the Zero concept car seen at May’s Beijing Motor Show. The newcomer retains the modern, angular look of the concept, while many of the car’s on MG’s show stand feature MINI-style graphics which can be added to personalise each car. The five-door supermini is set to go on sale in China early next year, priced from only £5,900. When the newcomer arrives in the UK late in 2012, its major selling point will be its price, which the firm hopes will undercut major rivals significantly. The MG3 is similar in size, albeit taller and narrower to the current five-door Ford Fiesta. Just one engine choice has been confirmed so far, a 109bhp 1.5-litre petrol that can power the car up to a top speed of 113mph. A smaller 67bhp 1.3-litre petrol unit is planned, as is a diesel, although the firm is still looking for a partner to produce a suitable engine. A hotter 156bhp turbo version of the 1.5-litre unit may also be made. MG’s parent firm SAIC also confirmed at the show that it’s on track to begin UK production of the firm’s Focus-rivalling MG6 in the first quarter of next year. The firm plans to build cars at the old Longbridge site near Birmingham, and will sell its products through Vauxhall dealerships, pending an agreement with GM.